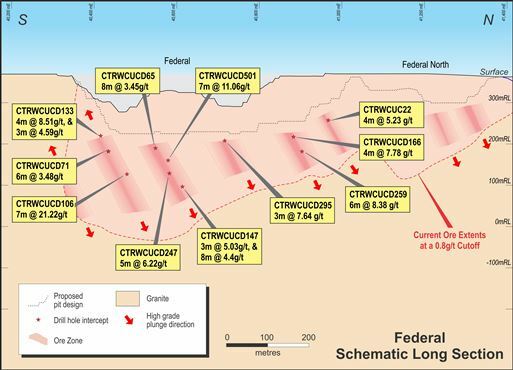 The Federal deposit is located 12km north-east of the Paddington mill, situated within the Golden Cities camp area which includes the previously mined Havana deposit. Mineralisation is hosted by granitoid lithologies and is controlled by a north-west trending fault zone. Gold mineralisation is associated with pyritic vein quartz, with vein density the dominant control on gold grade. Several plunging high-grade lodes within the broader lower-grade mineralised envelope are interpreted, and future work will review the potential to extend these lodes. As at 31 December 2014 an Indicated and Inferred Mineral Resource estimate of 3.81Mt @ 1.50g/t Au (184,000oz) Open Cut and 0.42Mt @ 6.187g/t Au (83,000oz) Underground has been defined. A Probable Ore Reserve estimate of 1.53Mt @ 1.46g/t Au (71,900oz) has also been defined. The Federal project a part of the Golden Cities Mining Centre (along with Havana-Suva and Jakarta deposits) and forms part of the Norton Gold Fields life of mine plan after mining at Enterprise open cut is completed. Further drilling is planned at Federal in 2018 aimed at converting resource and expanding the reserve base.